T24004HPF - 1/24 Scale Club Chassis Kit (For wood tracks) [T24004HPF] - $65.95 : TSR Slot Cars, TSR Slot Cars - Dedicated to Slot Car racing, collecting, restoration, track design, electronics and software. 1/24-Scale Club-Racing Chassis in kit form. For use on routed wood tracks where traction compounds are being used even in moderate amount. The use of a min. 5-amp variable voltage power supply and PM electronic controller is highly recommended. The T24004HPF chassis kit is fitted with free-wheeling front and setscrew rear aluminum wheels, neoprene foam sponge tires, aluminum setscrew spur gear and drill blank rear axle. The motor can be fastened with two supplied stainless steel metric screws. Supplied with pin-style body mounts only. No traction magnet is supplied with this chassis. Traction magnet, model-kit body-mounting side mounts and hardware are available separately. 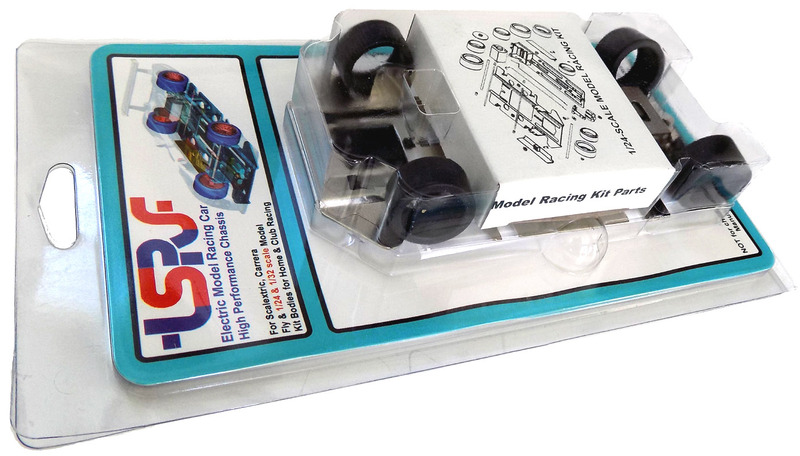 This ready to race, adjustable chassis comes packaged in a protective clear-plastic pouch, where the tires are not in contact with any interference over their entire diameter, guarantying roundness.